Bus from Fresno to Yosemite starts this weekend! Adds exciting local options! This weekend, public transit service begins for the first time connecting Fresno to Yosemite. Aside from serving a tourist purpose, the system also will operate as an important commuter and community connection. Thanks to the anonymous comment letting me know the schedule was up! YARTS has developed an extensive long-distance bus network to serve Yosemite. The first bus leaves the Fresno airport bright and early at 4am, with the next four trips starting at the Greyhound station at 7:52am, 9:10am, 12:10pm and 2:10pm. 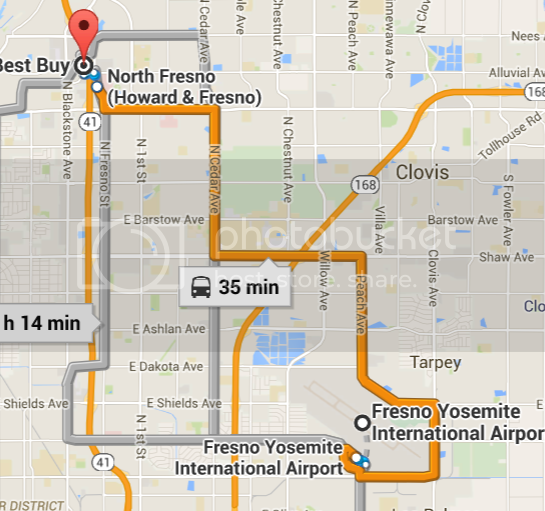 A final commuter run leaves Fresno at 5:45pm and goes only as far as Oakhurst. The trip is scheduled at around 4 hours, from end to end. with the commuter portion (to Oakhurst) taking a little under two. The return trips are reversed, with the first trip starting at Oakhurst (6:00am) arriving downtown before 8am, and the last bus leaving Yosemite at around 7pm. Check it out for yourself here (PDF). Overall, the schedule seems very well thought out, and fares are reasonable. 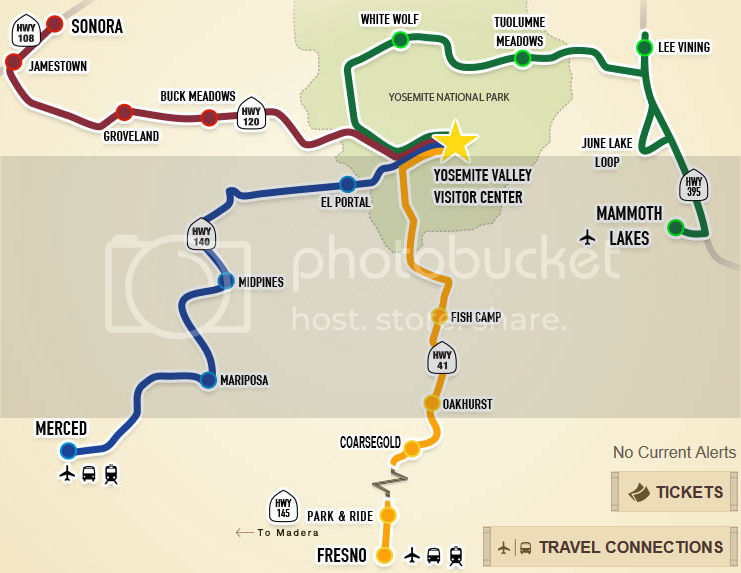 Going from Fresno to Yosemite costs $30 for the round trip, and that includes park admission. To Coarsegold and Oakhurst, round trip service from Fresno is only $15. One child under 12 rides for free with an adult. The new YARTS service allows for improved local transit connections! Service from the Madera Park and Ride to Fresno is listed as $6 round trip, and no pricing is listed for trips within Fresno. Presumably, that is not their market however…. 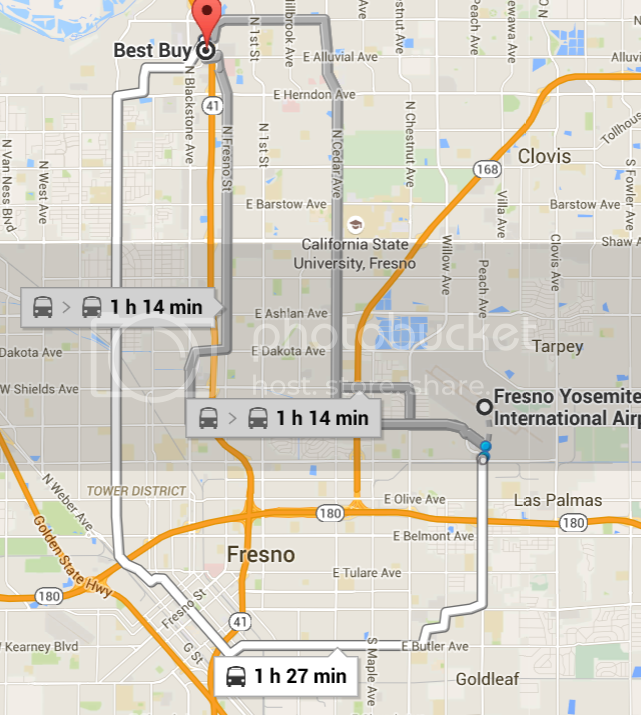 Say you want to get from Fresno Amtrak, to Fresno Airport. With FAX, you’d have to take an 8 minute walk to the Courthouse Park, and then a 34 minute bus ride on Route 26. With wait times, you’re looking at an hour! If your times work out, with this new bus, you could do it in a flat 15 minutes! On weekends, the FAX bus only makes this trip 12 times a day (once an hour), so adding 5 new trip options is a big deal. In fact, this would be the first addition of any public transit service in Fresno in over a decade. 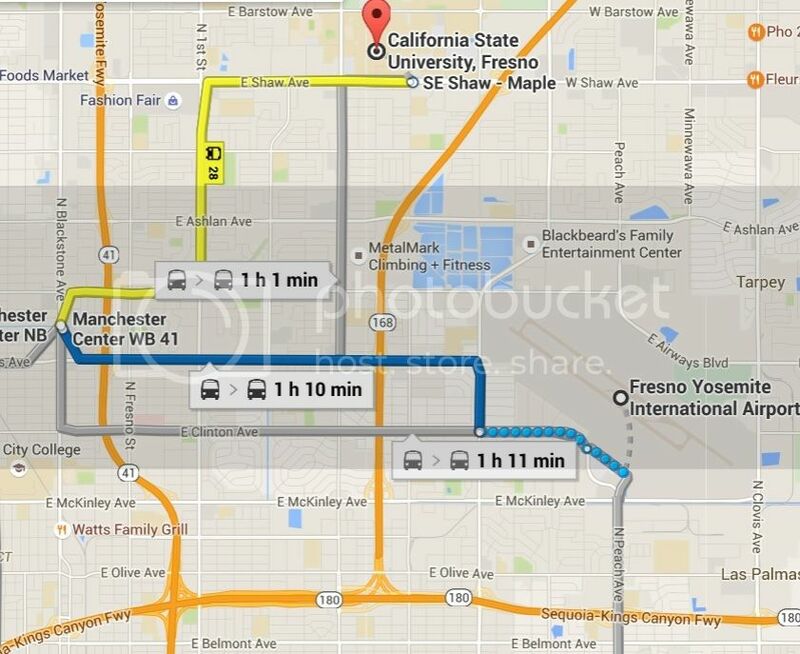 On FAX, going from Fresno Amtrak to Fresno State requires that same 8 minute walk, and then a 36 minute bus ride! YARTS will do the trip in under 25 minutes, with no walking. 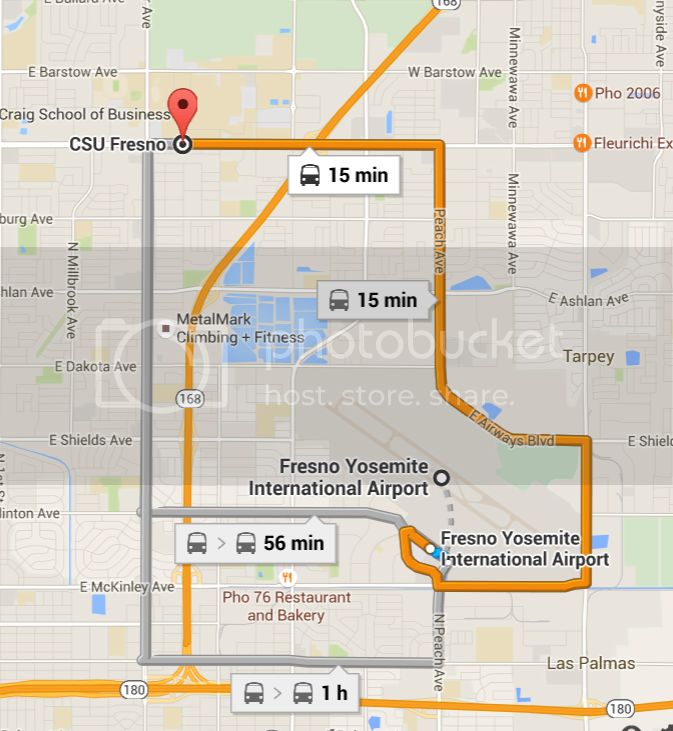 Finally, Google Maps shows that to get from the Airport to Fresno State via FAX it would take over 1 hour! And you’d have to sweat out the transfers, on a system that refuses to invest in technology that lets riders know when the next bus is coming. On YARTS, the very same trip will fly by in 15 minutes! YARTS has taken the initiative to make sure they’re listed as a Google Maps transit option as of this weekend. So when you search the routes for today or tomorrow, you get the map above. Presumably, this option won’t be well advertised, because they want riders going to Yosemite, but at least for the northbound trip, you could simply buy a ticket to Madera and get off early. It’ll cost a little more than FAX, but with those time savings, it would absolutely be worth it.Southbound trips may be less reliable, because you’d be counting on a bus being on time after over 3 hours on the road. Of course the bus will also provide an excellent lifeline to the foothill communities, and the early and evening rush hour trips show that as a goal. Further, monthly passes may be made available. The bus also takes cash and credit card, making payment easier than on local buses. It is unclear at this time if signage will be going up to advertise the bus stops, and if there is a park and ride arrangement with Kaiser to allow people to park there all day for free. For now, the bus is scheduled to run daily from May 23 to September 27, and hopefully it proves a success and is extended, at least on weekends, into the fall. YARTS IS a year-round service. The summer schedules runs from May 23rd- September 27th. The winter schedule starts September 28th. Please visit our website at http://www.yarts.com for for information or like us on Facebook at https://www.facebook.com/rideyarts. They made all the stops going northbound right? I can't see how they could stop you from paying a Madera fare and getting off early. Coming back they could stop you from getting on, but as I mentioned, it would be incredibly unreliable anyway because the bus could be 30 minute early or late after a 4 hour drive. Did you find the bus to be comfortable? Yeah, I'm unclear about whether you could get away with paying a much higher fare (compared to FAX) and getting off early. I think they would frown on it though. It has to do with not competing with FAX apparently, but it does seem odd. I won't try the northbound run until tomorrow, and I'll start from the northernmost stop in Fresno. But I'm sure they make all the stops to pick people up. I like YARTS pretty well. The buses are comfortable enough and the drivers are friendly. It's a little pricey though. Madera County Connection is a quarter the price, but I've never tried it since it takes a very slow and indirect route to Fresno. The trip time from Fresno to Yosemite is much too long to be attractive. It's a milk run … particularly within Fresno.